I am also starting a new adventure in the new year (in addition to my current job, which I still LOVE! ), working part time in the evenings and summers for Learners Edge, Inc. evaluating and coordinating two online and one on-site course over the next six months. This puts some added pressure to finish up this current Elementary book, but that's what Zombies do best... stay up all night, eat some chocolate Santas, and get 'r dun. 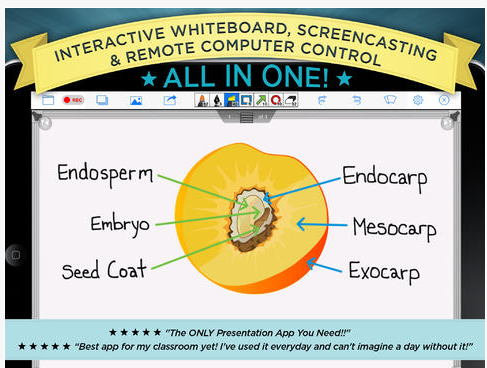 I find it quite funny that one of our oldest and most reliable apps has taken a complete back seat to more "exciting" presentation apps, like Educreations, ShowMe and Prezi, just to name a few. Not that there is anything wrong with those; I still like them very much! But when you're in a pinch, and you need to make a quick demo video of something you're doing on your computer, Doceri Desktop gives you a nice hands-free way to do it, complete with an ink layer! 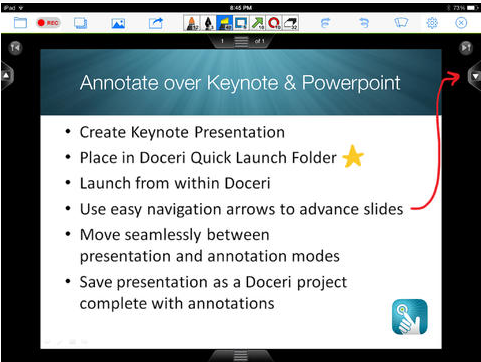 Many teachers have discovered that you can download the free computer version of Doceri from their website, as well as the iPad app, and use the program over Airplay to remote-control your Powerpoints, Smart lessons, PDF's, websites, whatever it is you are displaying. BUT the vast majority of those teachers have forgotten that there is a record button sitting up there in the top/left corner. You can see it from here, can't you?!? If you're going to be out sick the next day, simply pop up your lesson, in whatever format you've got, turn on Doceri, hit record, and start talking/surfing. There's even a "pause" button if you need to stop and cough. Or worse. SERIOUSLY people, there are some nasty, nasty bugs going around right now. Take it easy! Take a day off... do some Christmas shopping, at the very least. Anyhoo, when you feel like continuing, hit the record button again and keep going with your lesson. Don't forget about the ink layer button! This tool makes Doceri sooooo much better than Splashtop, not to mention the never-ending free trial ;) You can hit the start/stop button on the pen as well, while you're still recording, and move back to remote controlling your computer. I usually try to keep my recording to under 5 minutes, so as not to "lose" the audience. 2-3 minutes is probably more realistic. You can always do multiple recordings as well. When you're done, go to the folder icon in the top-left corner. Select the presentation you just made, and save it to your camera roll. From there, open your Google Drive app and use the upload button to grab the video from your iPad. I shared directions and screen shots for how to do this on my last blog post. You can then share your video anywhere! Your LMS, an email, a "Remind" message, a Tweet, on Google Classroom, you name it. Instant flipped lesson. Or email it to your sub to use while you STAY HOME AND REST!! **Just don't forget to adjust the "sharing" settings to say "anyone with the link can view". Otherwise you're going to get a big room full of crickets and a video that won't play. This may not be the most exciting app mash-up I've shared, but it's definitely one of the more under-utilized ones. You don't have to be Mozart or Shakespeare to make screencasts. Just start simple! Record while you're teaching. The kids don't even have to know that you're recording. 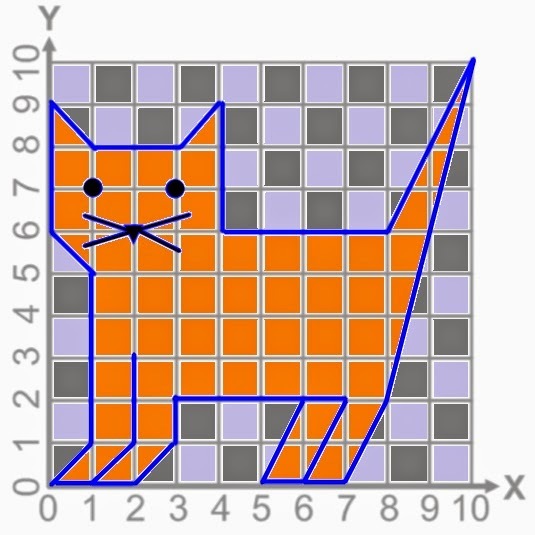 You could even try it with my new TpT item, Graphing Pets! Put the instructional page up on the Smartboard and turn on Doceri. Hit record... read through it with the students, turn on the ink layer, and either you as the teacher, or one of the students, can write down the answers and complete the graphs. Then try out the process I've shared, and post it as a flip-lesson, with choices of the other 7 graph pets for homework! Now it's waaaaaay past Zombie's bed time... Nighty night! Immanda, great post! Love the way you are using Doceri to flip your class and give students a chance to catch up on missed classes. But agree, that Doceri could have been better. Which is why I find myself using splashtop, explaineverything or annotate.net.